The July Monarchy (French: la monarchie de Juillet), officially the Kingdom of the French (French: Royaume des Français), was a period of liberal constitutional monarchy in France under King Louis-Philippe starting with the July Revolution (or Three Glorious Days) of 1830 and ending with the Revolution of 1848. It began with the overthrow of the conservative government of Charles X and his senior line of the House of Bourbon. Louis-Philippe, a member of the traditionally more liberal Orléans branch of the House of Bourbon, proclaimed himself roi des Français ("King of the French") rather than roi de France ("King of France"), emphasizing the popular origins of his reign. The new regime's ideal was explicated by Louis-Philippe's famous statement in January 1831: "We will attempt to remain in a juste milieu (the just middle), in an equal distance from the excesses of popular power and the abuses of royal power." Pushed to the throne by an alliance between the people of Paris, the Republicans, who had set up barricades in the capital, and the liberal bourgeoisie, the "Citizen King" was overthrown by similar barricades during the February Revolution of 1848, which led to the proclamation of the Second Republic. After his ousting and subsequent exile to England, the liberal, Orleanist faction, continued to support a return of the House of Orléans to the throne, opposed by the counter-revolutionary Legitimists, but the July Monarchy was to be the last monarchy of France. The Legitimists withdrew from the political stage to their castles, leaving the stage opened for the struggle between the Orleanists and the Republicans. The July Monarchy (1830-1848) is generally seen as a period during which the haute bourgeoisie was dominant, and marked the shift from the counter-revolutionary Legitimists to the Orleanists, who were willing to make some compromises with the changes brought by the 1789 Revolution. Louis-Philippe was crowned “King of the French,” instead of "King of France": this marked his acceptance of the popular sovereignty, which replaced the Ancien Régime 's divine right. Louis-Philippe clearly understood his base of power: the wealthy bourgeoisie had carried him aloft during the July Revolution through their work in the Parliament, and throughout his reign, he kept their interests in mind. Louis-Philippe, who had flirted with liberalism in his youth, rejected much of the pomp and circumstance of the Bourbons and surrounded himself with merchants and bankers. The July Monarchy, however, remained a time of turmoil. A large group of Legitimists on the right demanded the restoration of the Bourbons to the throne. On the left, Republicanism and, later Socialism, remained a powerful force. Late in his reign Louis-Philippe became increasingly rigid and dogmatic and his President of the Council, François Guizot, had become deeply unpopular, but Louis-Philippe refused to remove him. The situation gradually escalated until the Revolutions of 1848 saw the fall of the monarchy and the creation of the Second Republic. However, during the first several years of his regime, Louis-Philippe appeared to move his government toward legitimate, broad-based reform. The government found its source of legitimacy within the Charter of 1830, written by reform-minded members of Chamber of Deputies upon a platform of religious equality, the empowerment of the citizenry through the reestablishment of the National Guard, electoral reform, the reformation of the peerage system, and the lessening of royal authority. And indeed, Louis-Phillipe and his ministers adhered to policies that seemed to promote the central tenets of the constitution. However, the majority of these policies were veiled attempts to shore up the power and influence of the government and the bourgeoisie, rather than legitimate attempts to promote equality and empowerment for a broad constituency of the French population. Thus, though the July Monarchy seemed to move toward reform, this movement was largely illusory. During the years of the July Monarchy, enfranchisement roughly doubled, from 94,000 under Charles X to more than 200,000 by 1848 . However, this represented only roughly one percent of population, and as the requirements for voting were tax-based, only the wealthiest gained the privilege. By implication, the enlarged enfranchisement tended to favor the wealthy merchant bourgeoisie more than any other group. Beyond simply increasing their presence within the Chamber of Deputies, this electoral enlargement provided the bourgeoisie the means by which to challenge the nobility in legislative matters. Thus, while appearing to honor his pledge to increase suffrage, Louis-Philippe acted primarily to empower his supporters and increase his hold over the French Parliament. The inclusion of only the wealthiest also tended to undermine any possibility of the growth of a radical faction in Parliament, effectively serving socially conservative ends. Further expressions of this conservative trend came under the supervision of Perier and the then Minister of the Interior, François Guizot. The regime acknowledged early on that radicalism and republicanism threatened it, undermining its laissez-faire policies. Thus, the Monarchy declared the very term republican illegal in 1834. Guizot shut down republican clubs and disbanded republican publications. Republicans within the cabinet, like the banker Dupont, were all but excluded by Perier and his conservative clique. Distrusting the sole National Guard, Louis-Philippe increased the size of the army and reformed it in order to ensure its loyalty to the government. Though two factions always persisted in the cabinet, split between liberal conservatives like Guizot (le parti de la Résistance, the Party of Resistance) and liberal reformers like the aforementioned journalist Adolphe Thiers (le parti du Mouvement, the Party of Movement), the latter never gained prominence. After Perier came count Molé, another conservative. After Molé came Theirs, a reformer later sacked by Louis-Philippe after attempting to pursue an aggressive foreign policy. After Theirs came the conservative Guizot. In particular, the Guizot administration was marked by increasingly authoritarian crackdowns on republicanism and dissent, and an increasingly pro-business laissez-faire policy. This policy included protective tariffs that defended the status quo and enriched French businessmen. Guizot’s government granted railway and mining contracts to the bourgeois supporters of the government, and even contributing some of the start-up costs. As workers under these policies had no legal right to assemble, unionize, or petition the government for increased pay or decreased hours, the July Monarchy under Perier, Molé, and Guizot generally proved detrimental to the lower classes. In fact, Guizot’s advice to those who were disenfranchised by the tax-based electoral requirements was a simple “enrichissez-vous” – enrich yourself. Following the ouster of Napoléon Bonaparte in 1814, the Allies restored the Bourbon Dynasty to the French throne. The ensuing period, the Bourbon Restoration, was characterized by conservative reaction and the re-establishment of the Roman Catholic Church as a power in French politics. The relatively liberal Comte de Provence, brother of the deposed Louis XVI ruled as Louis XVIII from 1814–1824 and was succeeded by his more conservative younger brother, the former Comte d'Artois, ruling as Charles X from 1824. Despite the return of the House of Bourbon to power, France was much changed from the era of the ancien régime. The egalitarianism and liberalism of the revolutionaries remained an important force and the autocracy and hierarchy of the earlier era could not be fully restored. Economic changes, which had been underway long before the revolution, had progressed further during the years of turmoil and were firmly entrenched by 1815. These changes had seen power shift from the noble landowners to the urban merchants. The administrative reforms of Napoleon, such as the Napoleonic Code and efficient bureaucracy, also remained in place. These changes produced a unified central government that was fiscally sound and had much control over all areas of French life, a sharp difference from the complicated mix of feudal and absolutist traditions and institutions of pre-Revolutionary Bourbons. Louis XVIII, for the most part, accepted that much had changed. However, he was pushed on his right by the Ultra-royalists, led by the comte de Villèle, who condemned the doctrinaires' attempt to reconcile the Revolution with the monarchy through a constitutional monarchy. Instead, the Chambre introuvable, elected in 1815 banished all Conventionnels who had voted for Louis XVI's death and passed similar reactionary laws. Louis XVIII was forced to dissolve this Chamber, dominated by the Ultras, in 1816, fearing a popular uprising. The liberals thus governed until the 1820 assassination of the duc de Berry, nephew of the king and known supporter of the Ultras, which brought Villèle's Ultras back to power (vote of the Anti-Sacrilege Act in 1825, and of the loi sur le milliard des émigrés, Act on the émigrés' billions). His brother Charles X, however, took a far more conservative approach. He attempted to compensate the aristocrats for what they had lost in the revolution, curbed the freedom of the press, and reasserted the power of the Church. In 1830 the discontent caused by these changes and Charles' authoritarian nomination of the Ultra prince de Polignac as minister culminated in an uprising in the streets of Paris, known as the 1830 July Revolution (or, in French, les trois Glorieuses - The three Glorious days - of 27, 28 and 29 July). Charles was forced to flee and Louis-Philippe d'Orléans, a member of the Orléans branch of the family, and son of Philippe Égalité who had voted the death of his cousin Louis XVI, ascended the throne. Louis-Philippe ruled, not as "King of France" but as "King of the French" (an evocative difference for contemporaries). On 7 August 1830, the 1814 Charter was revised. The preamble recalling the Ancien Régime was suppressed, and the King of France became the "King of the French," (also known as the "Citizen King") establishing the principle of national sovereignty over the principle of the divine right. The new Charter was a compromise between the Doctrinaires opposition to Charles X and the Republicans. Laws enforcing Catholicism and censorship were repealed and the revolutionary tricolor flag re-established. Louis-Philippe pledged his oath to the 1830 Charter on 9 August setting up the beginnings of the July Monarchy. Two days later, the first cabinet was formed, gathering the Constitutionalist opposition to Charles X, among whom Casimir Perier, the banker Jacques Laffitte, Count Molé, the duke of Broglie, François Guizot, etc. The new government's first aim being to bring back the public order, while at the same time feinting to acclaim the revolutionary forces which had just triumphed. Assisted by the people of Paris in overthrowing the Legitimists, the Orleanist bourgeoisie had to establish its new order. Louis-Philippe decided on 13 August 1830 to establish the armoiries of the House of Orléans as state symbols.Reviewing on 29 August a parade of the Parisian National Guard which acclaimed it, he in turn exclaimed to its leader, La Fayette: "This is worth more to me than coronation at Reims !". The new regime then decided on 11 October that all people injured during the Three Glorious Days (500 orphans, 500 widows and 3,850 people injured) would be given an award and presented a draft law indemnifying them to the height of 7 million, and created a commemorative medal for the July Revolutionaries. Ministers lost their style of Monseigneur and Excellence to become simply Monsieur le ministre. The new king's older son, Ferdinand-Philippe, was given the title of duke of Orléans and royal prince, while his daughters and his sister, Adélaïde d'Orléans, were named princesses of Orléans — and not of France, since there was no more any "King of France" nor "House of France." Unpopular laws taken during the Restoration were repealed, including the 1816 amnesty law which had banished the regicides — apart of its article 4, concerning the Bonaparte family. The Church of Sainte-Geneviève was once again returned to its functions of a laic temple, under the name of Panthéon . Various budget restrictions struck the Catholic Church, while the 1825 Anti-Sacrilege Act which envisioned death penalties for sacrileges was repealed. Civil unrest continued during three months, supported by the left-wing press. Louis-Philippe's government was not able to put an end to it, mostly because the National Guard was headed by one of the Republican leaders, the marquis de La Fayette. The latter requested a "popular throne surrounded by Republican institutions." The Republicans then gathered themselves in popular clubs, in the tradition established by the 1789 Revolution. Some of thoses were fronts for secret societies (for example, the Blanquist Société des Amis du Peuple), which requested political and social reforms, or the execution of Charles X' ministers (Jules de Polignac, Jean de Chantelauze, the Count de Peyronnet and the Count de Guernon-Ranville). Strikes and demonstrations were permanent. In order to relaunch the economy and finally establish public order, the government had the Assembly vote in autumn 1830 a credit of 5 million Francs to subsidize public works, mostly roads. Then, to prevent bankruptcies and the increase of unemployment, especially in Paris, the government granted its guaranty for firms which encountered themselves in difficult situations, granting them 60 million. Those subsidies mainly went in the pockets of big entrepreneurs dedicated to the new regimes, such as the printer Firmin Didot. The death of the Prince of Condé on 27 August 1830, found hanged, set up the first scandal of the July Monarchy. The Legitimists quickly accused, without proofs, Louis-Philippe and the Queen Marie-Amélie of having assassinated the ultra-royalist Prince, with the alleged motive of letting their son, the duc d'Aumale, to set hands on his fortune. It is commonly accepted that he died following sexual games with his mistress, the baroness de Feuchères. In the meanwhile, the government expelled from the administration all of the Legitimist supporters who refused to pledge allegiance to the new regime, leading to the return to political affairs of most of the staff of the First Empire who had been expelled during the Second Restoration. This renewal of political and administrative staff was humorously illustrated by a vaudeville of Jean-François Bayard. The Minister of the Interior, Guizot, renewed all the prefectoral administration and the mayors of large cities. The Minister of Justice, Dupont de l'Eure, assisted by his secretary general, Mérilhou, dismissed most of the public prosecutors. In the Army, the General de Bourmont, a follower of Charles X who was commanding the invasion of Algeria, was replaced by Bertrand Clauzel. Generals, ambassadors, plenipotentiary ministers and half of the Conseil d'Etat were replaced. In the Chamber of Deputies, a quarter of the seats (119) were submitted to a new election in October, leading to the defeat of the Legitimists. In sociological terms, however, this renewal of the political staff did not mark any great change of elites: land-owners, civil servants and liberal professions continued to dominate the state of affairs, leading the historian David Pinkney to deny any claim of a "new regime of a grande bourgeoisie". Historian Guy Antonetti also underscores the similar sociological membership of the new elites, the main difference residing in the "substitution, inside the same social group, of the followers of a mentality in favour of the 1789 spirit to those who were opposed to it: socially similar, ideologically different. 1830 has only been a change of team in the same side, and not a change of side. The "Resistance" and the "Movement"
Although some voices began to push for the closure of the Republican clubs, which fomented revolutionary agitation, the Minister of Justice, Dupont de l'Eure, and the Parisian public prosecutor, Bernard, both Republicans, refused to prosecute revolutionary associations (although the French law prohibited meetings of more than 20 persons). However, on 25 September 1830, the Minister of Interior Guizot responded to a deputy's question on the subject by stigmatizing the "revolutionary state," conflated with chaos, to which he opposed the "Glorious Revolution.". Two political currents thereafter made their appearance on stage, and would structure political life under the July Monarchy: the "Parti du mouvement" (Party of the Movement) and the "Parti de la résistance" (Party of the Resistance). The first one was reformist and in favor of support to the nationalists which were trying, all over of Europe, to shake the grip of the various Empires in order to create nation-states. Its mouthpiece was Le National. The second one was conservative and supported peace with European monarchs, and had as mouthpiece Le Journal des débats. The trial of Charles X's ministers, arrested in August 1830 while they were fleeing, became the major political issue. The left requested their heads, but was opposed by Louis-Philippe who feared a spiral of violence and the renewal of revolutionary Terror. Thus, the Chamber of Deputies voted on 27 September 1830 a resolution charging the former ministers, but at the same time invited in an 8 October 1830 address to the king Louis-Philippe to present a draft law repealing the death penalty, at least concerning political matters. This in turn provoked popular discontent on 17 and 18 October, with the masses marching on the Fort of Vincennes where the ministers were detained. Following these riots, Interior Minister Guizot requested the resignation of the prefect of the Seine, Odilon Barrot, who had criticized the parliamentarians' address to the king. Supported by Victor de Broglie, Guizot considered that an important civil servant could not criticize an act of the Chamber of Deputies, moreover when the latter had been approved by the King and his government. Dupont de l'Eure took Barrot's side, threatening to resign if the King disavowed him. The banker Laffitte, one of the main figures of the Parti du mouvement, thereafter offered himself to coordinate the ministers with the title of "President of the Council." This immediately led Broglie and Guizot, of the Parti de l'Ordre, to resign, followed by Casimir Perier, André Dupin, the Count Molé and Joseph-Dominique Louis. Confronted to the Parti de l'Ordre's defeat, Louis-Philippe decided to put Laffitte to trial, hoping that the exercise of power would discredit him. He thus called him to form a new government on 2 November 1830. Although Louis-Philippe strongly disagreed with the banker Laffitte and secretly pledged to the duke of Broglie that he would not support him at all, the new President of the Council was tricked into trusting his king. The trial of Charles X’s former ministers took place from 15 December to 21 December 1830 before the Chamber of Pairs, surrounded by rioters demanding their death. They were finally sentenced to life detention, accompanied by civil death for Polignac. La Fayette’s National Guard maintained the public order in Paris, affirming itself as the bourgeois watchdog of the new regime, while the new Interior Minister, Camille de Montalivet, kept the ministers in safety by detaining them in the fort of Vincennes . But by demonstrating the National Guard’s importance, La Fayette had made his position fragile, and was quickly forced to resign. This led to the Minister of Justice Dupont de l’Eure’s resignation. Furthermore, in order to avoid exclusive dependence on the National Guard, the “Citizen King” charged Marshal Soult, the new Minister of War, with reorganizing the Army. In February 1831, Soult presented his project, aiming to increase the military's effectiveness. Among other reforms, the project included the 9 March 1831 law creating the Foreign Legion. In the meantime, the government enacted various reforms demanded by the Parti du Mouvement, which had been registered in the Charter (art. 69). The 21 March 1831 law on municipal councils reestablished the principle of election and enlarged the electoral base (founded on census suffrage) which was thus increased tenfold in comparison with the legislative elections (approximately 2 to 3 million electors from a total population of 32,6 million). The 22 March 1831 law re-organized the National Guard; the 19 April 1831 law, voted after two months of debate in Parliament and promulgated after Laffitte’s downfall, decreased the electoral income level from 300 to 200 Francs and the level for eligibility from 1,000 to 500 Francs. The number of voters increased from a number of less than 100,000 to 166,000: one Frenchman on 170 possessed the right to vote. 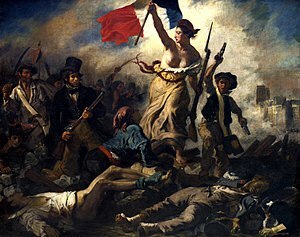 Despite these reforms, which targeted the bourgeoisie rather than the people, Paris was once again rocked by riots on 14 February and 15 February 1831, leading to Laffitte’s downfall. The immediate cause of the riots was to be found in a funeral service organized by the Legitimists at Saint-Germains l’Auxerrois Church in memory of the ultra-royalist duke of Berry, assassinated in 1820. The commemoration turned into a political demonstration in favour of the count of Chambord, Legitimist pretender to the throne. Seeing in this celebration an intolerable provocation, the Republican rioters ransacked the church two days in a row, before turning to other churches. The revolutionary movement spread to other cities. Confronted with renewed unrest, the government abstained from any strong repression. The prefect of the Seine Odilon Barrot, the prefect of police Jean-Jacques Baude, and the new commandant of the National Guard, General Georges Mouton, remained passive, triggering Guizot’s indignation, as well as the Republican Armand Carrel’s criticisms against alleged demagogy of the government. Far from suppressing the crowds, the government had the Archbishop of Paris Mgr. de Quélen arrested, as well as charging the friar of Saint-Germain-l’Auxerrois and other priests, along with some other monarchists, with having provoked the masses. In a gesture of appeasement, Laffitte, supported by the royal prince Ferdinand-Philippe, duke of Orléans, proposed to the king to suppress the fleur-de-lys, symbol of the Ancien Régime, on the state seal. With obvious discontent, Louis-Philippe finally signed the 16 February 1831 ordinance substituting to the armoiries of the House of Orléans a shield with an open book, on which could be read “Charte de 1830”. Another symbol of the monarchy, the fleur-de-lys, was removed from public buildings, etc. This new defeat of the king sealed Laffitte’s fate. On 19 February 1831, Guizot verbally attacked Laffitte in the Chamber of Deputies, daring him to dissolve the Chamber and present himself before the electors. Laffitte accepted, but the king, who was the only one entitled to dissolve the Chamber, preferred to wait some days more. In the meanwhile, the prefect of the Seine Odilon Barrot was replaced by Taillepied de Bondy at Montalivet's request, and the prefect of police Baude by Vivien de Goubert. To make matters worse, in this insurrectionary climate, the economic situation was fairly bad. Louis-Philippe finally tricked Laffitte into resigning by having his Minister of Foreign Affairs, Horace Sébastiani, pass him a note written by the French ambassador to Vienna, Marshal Maison, and which had arrived in Paris on 4 March 1831, which announced an imminent Austrian intervention in Italy. Taking knowledge of this note in Le Moniteur of 8 March, the President of the Council Laffitte requested immediate explanations from Sébastiani, who disclosed to him that he had followed royal orders. After a meeting with the king, Laffitte submitted to the Council of Ministers a belligerent program, and was subsequently disavowed, forcing him to resign. Most of his ministers had already negotiated their positions in the forthcoming government. Having succeeded in outdoing the Parti du Mouvement, the "Citizen King" called to power the Parti de la Résistance. However, Louis-Philippe was not really much more comfortable with one side than with the other, being closer to the center. Furthermore, he felt no sympathy for its leader, the banker Casimir Perier, who replaced Laffitte on 13 March 1831 as head of the government. His aim was more to re-establish order in the country, letting the Parti de la Résistance assume the responsibility of unpopular measures. Perier, however, managed to impose to the king his conditions, among which the pre-eminence of the President of the Council over other ministers, and his right to call cabinet councils outside of the effective presence of the king. Furthermore, Casimir Perier obtained that the liberal royal prince, Ferdinand-Philippe d'Orléans, ceased to participate to the Council of Ministers. Despite this, Perier valued the king's prestige, haling him, on 21 September 1831, to move from his family residence, the Palais-Royal , to the royal palace, the Tuileries. The banker Perier established the new government's principles on 18 March 1831: ministerial solidarity and authority of the government on the administration: "the principle of the July Revolution... is not insurrection... it is resistance to the aggression of the power" and, on the external plan, "a pacific attitude and the respect of the non-intervention principle." The vast majority of the Chamber applauded the new government and granted him a comfortable majority. Perier garnered the support of the cabinet through oaths of solidarity and strict discipline for dissenters. He excluded reformers from official discourse, and abandoned the regime’s unofficial policy of mediating in labor disputes in favor of a strict laissez-faire policy that favored employers. On 14 March 1831, under the initiative of a patriotic society created by the mayor of Metz , Jean-Baptiste Bouchotte, the opposition's press launched a campaign in order to gather funds to create a national association aimed at struggling against any Bourbon Restoration and the risks of foreign invasion. All of the major figures of the Republican Left (La Fayette, Dupont de l'Eure, Jean Maximilien Lamarque, Odilon Barrot, etc.) supported it. Local committees were created all over France, leading the new president of the Council, Casimir Perier, to enact a circular prohibiting civil servants to take membership in this association, charged of rivaling the state itself by implicitly accusing it of not complying with its duties. In the beginning of April 1831, the government took some unpopular measures, forcing several important personalities to resign: Odilon Barrot was dismissed from the Council of State, General Lamarque's military command suppressed, Bouchotte and the Marquis de Laborde forced to resign. When on 15 April 1831 the Cour d'assises acquitted several young Republicans (Godefroy Cavaignac, Joseph Guinard and Audry de Puyraveau's son), mostly officers of the National Guard who had been arrested during the December 1830 troubles consecutive to the trial of Charles X's ministers, new riots acclaimed the news on 15-16 April. But Perier, implementing the 10 April 1831 law outlawing public meetings, used the military as well as the National Guard to dissolve the crowds. In May, the government used for the first time fire hoses as crowd control techniques. Another riot, started on the rue Saint-Denis on 14 June 1831, degenerated into an open battle against the National Guard, assisted by the Dragoons and the infantry. The riots continued on 15 June and 16 June. The major unrest, however, took place in Lyon with the Canuts Revolt, started on 21 November 1831, and during which parts of the National Guard took the demonstrators' side. In two days, the Canuts took control of the city and expelled General Roguet and the mayor Victor Prunelle. On 25 November Casimir Perier announced to the Chamber of Deputies that Marshal Soult, assisted by the royal prince, would immediately march on Lyon with 20,000 men. They entered the former capital of the Gaul on 3 December re-establishing order without any bloodshed. Civil unrest, however, continued, and not only in Paris. On 11 March 1832, sedition exploded in Grenoble during the Carnaval. The prefect had canceled the festivities after that a grotesque mask of Louis-Philippe had been shown, leading to popular demonstrations. The prefect then tried to have the National Guard dissolve the masses, but the latter refused, forcing him to call on the army. The 35th regiment of infantry (infanterie de ligne) obeyed the orders, but this in turn led the population to request their expulsion from the city. This was done on 15 March and the 35th regiment replaced by the 6th regiment, from Lyon. When Casimir Perier learnt the news, he dissolved the National Guard of Grenoble and immediately recalled the 35th regiment to Grenoble. Beside this continuing unrest, present in all of the provinces, Dauphiné, Picardie , in Carcassone , Alsace , etc., various Republican conspiracies threatened the government (conspiracy of the Tours de Notre-Dame in January 1832, of the rue des Prouvaires in February 1832, etc.) Even the trials were seized by the Republicans as a tribune opportunity: at the trial of the Blanquist Société des Amis du peuple in January 1832, Raspail harshly criticized the king while Auguste Blanqui gave free way to his socialist ideas. All of the accused denounced the government's tyranny, the incredibly high cost of Louis-Philippe's civil list, police persecutions, etc. The omnipresence of the French police, organized during the French First Empire by Fouché, was depicted by the Legitimist writer Balzac in Splendeurs et misères des courtisanes. The strength of the opposition led the royal prince to shift a bit more to the right-wing. In the second half of May 1831, Louis-Philippe, accompanied by Marshal Soult, started an official travel to Normandie and Picardie , where he was well received. From 6 June to 1 July 1831, he traveled in the east, where there was stronger Republican and Bonapartist activity, along with his two elder sons, the royal prince and the duke of Nemours, as well as with the comte d'Argout. The king stopped in Meaux, Château-Thierry , Châlons-sur-Marne (renamed Châlons-en-Champagne in 1998), Valmy , Verdun and Metz . There, in the name of the municipal council, the mayor made a very political speech where he expressed the wish to have the Peers' heredity suppressed, adding that France should intervene in Poland to assist the November Uprising against Russia. Louis-Philippe flatly denied all of these pretensions, stating that the municipal councils or the National Guard had no legitimacy in such matters. The king continued his visit to Nancy , Lunéville , Strasbourg , Colmar , Mulhouse , Besançon and Troyes , and his travel was, on the whole, an occasion to re-affirm his authority. Louis-Philippe had decided in the château de Saint-Cloud , on 31 May 1831, to dissolve the Chamber of Deputies, fixing legislative elections for 5 July 1831. However, he signed another ordinance on 23 June in Colmar in order to have them advanced to 23 July 1831, so as to avoid the risk of Republican agitation during the commemorations of the July Revolution. The general elections took place without incident, according to the new electoral law of 19 April 1831. However, the results disappointed the king and the president of the Council Perier: more than half of the deputies were re-elected, and their positions were unknown. The Legitimists obtained 104 seats, the Orleanist Liberals 282 and the Republicans 73. On 23 July 1831, the king developed Casimir Perier's program in the speech from the Throne: strict application of the Charter inside, and strict defense of the interests of France and its independence abroad. The deputies elected in the second round baron Girod de l'Ain, the government's candidate (181 votes), as president of the Chamber of Deputies, against the banker Laffitte (176 votes). But Dupont de l'Eure gained the first vice presidency with 182 voices (on a total of 344), while the government's candidate, André Dupin, lost with 153 voices only. Casimir Perier, who considered that his parliamentary majority was not strong enough, decided to resign. Louis-Philippe thereafter turned towards Odilon Barrot, who refused to assume governmental responsibilities, pointing out that he had only a hundred voices in the Chamber. However, during the 2 and 2 August 1831 elections of questeurs and secretaries, the Chamber elected mostly governmental candidates such as André Dupin or Benjamin Delessert, who obtained a strong majority against a far-left candidate, Eusèbe de Salverte. Finally, William I of the Netherlands's decision to invade Belgium — the Belgian Revolution had taken place the preceding year — on 2 August 1831, constrained Casimir Perier to remain in power in order to respond to the Belgian's assistance request. During the parliamentary debates concerning France's imminent intervention in Belgium, several deputies, led by baron Bignon, unsuccessfully requested a similar intervention to support Polish independence. However, on the domestic level, Casimir Perier decided to back up before the dominant opposition, and satisfied an old claim of the Left by repealing the Peers' heredity. Finally, the 2 March 1832 law on Louis-Philippe's pension fixed its amount to 12 million Francs a year, and one million for the royal prince, the duke of Orléans. The 28 April 1832 law, named after the Justice Minister Félix Barthe, reformed the 1810 Penal Code and the Code d'instruction criminelle. The cholera pandemic, originated in India in 1815, reached Paris around 20 March, 1832 and killed more than 13,000 people in April. The pandemic would last until September 1832, killing in total 100,000 with 20,000 of that in Paris alone. The disease, which origins were unknown at the time, provoked a popular panic. The people of Paris suspected poisoners, while the scavengers and mendiants revolted against the authoritative measures of public health. According to the historian and philosopher Michel Foucault, the cholera outbreak was first fought by what he called "social medicine," which focused on flux, circulation of air, location of cemeteries, etc. All those concerns, born of the miasma theory of disease, were thus mixed with urbanistic concerns of the management of populations. The cholera also struck the royal princess Madame Adélaïde, as well as d'Argout and Guizot. Casimir Perier, who went to visit on 1 April 1832, with the royal prince, the patients at the Hôtel-Dieu, was also infected, leading him to stop his ministerial activities, before dying on 16 May 1832. King Louis-Philippe was not unhappy to see Casimir Perier withdraw from the political scene, as he complained that Perier assumed all of the credits of the government's policies, while he himself had to assume all of its defaults. The "Citizen King" was therefore not pressed to find a new president of the Council, all the more since the Parliament was in vacation and that the troubled situation requested energical and swift measures. Indeed, the regime was attacked on all sides. The Legitimist duchess of Berry attempted an uprising in spring 1832 in Provence and Vendée , a stronghold of the ultra-royalists, while the Republicans headed an insurrection in Paris on 5 June 1832, on the occasion of the funerals of one of their leaders, General Lamarque, also struck dead by the cholera. General Mouton crushed the rebellion, killing 800. The scene was later depicted by Victor Hugo in Les Misérables. This double victory, both on the Carlists Legitimists and on the Republicans, was a success for the regime. Furthermore, the death of the duke of Reichstadt (Napoléon II) on 22 July 1832, in Vienna , marked another defeat for the Bonapartist opposition. Finally, Louis-Philippe had his elder daughter, Louise d'Orléans, married to the new king of the Belgians, Leopold I, on the anniversary of the establishment of the July Monarchy (9 August). Since the archbishop of Paris Quélen, a Legitimist, refused to celebrate this mixed marriage between a Catholic and a Lutheran, the wedding took place in the château de Compiègne . This royal alliance strengthened Louis-Philippe's position abroad. Louis-Philippe called a trusted man, Marshal Soult, to the presidency of the Council in October 1832. Soult was supported by a triumvirate composed of the main politicians of that time: Adolphe Thiers, the duke de Broglie and François Guizot. The conservative Journal des débats spoke of a "coalition of all talents", while the King of the French would eventually speak, with obvious deception, of a "Casimir Perier in three persons." In a circular addressed to the high civil servants and military officers, the new President of the Council, Soult, stated that he would explicitly followed the policies of Perier ("order inside", "peace abroad") and denounced both the Legitimist right-wing opposition and the Republican left-wing opposition. The new Minister of Interior, Adolphe Thiers, had his first success on 7 November 1832 with the arrest in Nantes of the rebellious duchess of Berry, detained in the citadel of Blaye . The duchess was then expelled to Italy on 8 June 1833. The opening of the parliamentary session on 19 November 1832, was a success for the regime. The governmental candidate, André Dupin, was easily elected in the first round as President of the Chamber, with 234 votes against 136 for the candidate of the opposition, Jacques Laffitte. In Belgium, Marshal Gérard assisted the young Belgian monarchy with 70,000 men, taking back the citadel of Antwerp , which capitulated on 23 December 1832. Strengthened by these recent successes, Louis-Philippe initiated two visits in the provinces, first in the north to meet with the victorious Marshal Gérard and his men, and then in Normandie, where Legitimist troubles continued, from August to September 1833.In order to conciliate themselves to public opinion, the new government took some popular measures, such a program of public works, leading to the achievement of the Arc de Triomphe in Paris, or the re-establishment, on 21 June 1833, of Napoleon I's statue on the Colonne Vendôme . The Minister of Public Instruction and Cults, François Guizot, had the famous law on primary education voted in June 1833, leading to the creation of an elementary school in each commune. Finally, a ministerial change was enacted after duke de Broglie's resignation on 1 April 1834. Broglie had been put in minority in the Chamber concerning the ratification of a treaty signed with the United States in 1831. This was a subject of satisfaction for the king, as it took out of the triumvirate the individual he disliked the most. The ministerial change coincide with the return of insurrectionary troubles in various cities of France. At the end of February 1834, a law submitting to public authorization the activities of the town criers, leading to several days of confrontations with the police. Furthermore, the 10 April 1834 law, primarily aimed against the Republican Society of Human Rights (Société des Droits de l'Homme), envisioned a crack-down on non-authorized associations. On 9 April 1834, when the Chamber of Peers was to vote the law, the Second Canut Revolt exploded in Lyon. The Minister of the Interior, Adolphe Theirs, decided to abandon the city to the insurgents, taking it back on 13 April with casualties of a 100 to 200 dead on both sides. The Republicans attempted to spread the insurrection to other cities, but failed in Marseille , Vienne , Poitiers and Châlons-sur-Marne . The threat was more serious in Grenoble and especially in Saint-Etienne on 11 April but finally public order was swiftly restored. The greater danger to the regime was, as often, in Paris. Expecting troubles, Theirs had concentrated 40,000 men there, visited by the king on 10 April. Furthermore, Theirs had made "preventive arrests" against the 150 main leaders of the Society of Human Rights, and outlawed its mouthpiece, La Tribune des départements. Despite these measures, barricades were set up in the evening of 13 April 1834, leading to a harsh repression, including a massacre of all the inhabitants of a house (men, women, children and elders) from where a shot had been fired, immortalized by a lithography of Honoré Daumier. To express their support to the monarchy, both Chambers gathered themselves in the Palace of the Tuileries on 14 April. In a gesture of appeasement, Louis-Philippe cancelled his feast-day celebration on 1 May, and publicly announced that the sums that were to be used for these festivities would be dedicated to the orphans, widows and injured. In the same time, he ordered Marshal Soult to make wide publicity of these events in all of France (the provinces being more conservative than Paris), to convince them of the "necessary increase of the Army.". More than 2,000 arrests were made following the riots, in particular in Paris and Lyon. The suspects were deferred to the Chamber of Paris, in accordance with art. 28 of the Charter of 1830, for conspiracy against state security (attentat contre la sûreté de l'État). The Republican movement was decapitated, so much that even the funerals of La Fayette on 20 May 1834, were quiet. As soon as 13 May the Chamber of Deputies voted a credit of 14 million in order to increase the army to 360,000 men. Two days later, they also adopted a very repressive law on detention and use of military weapons. Louis-Philippe decided to seize the occasion to dissolve the Chamber and organize new elections, held on 21 June 1834. However, the results were not as good as expected: although the Republicans were almost excluded, the Opposition retained around 150 seats (approximatively 30 Legitimists, the rest being followers of Odilon Barrot, who was an Orleanist supporter of the regime, but headed the Parti du mouvement). Furthermore, in the ranks of the majority itself, composed of about 300 deputies, a new faction, the Tiers-Parti, led by André Dupin, could on some occasions defect to the majority and give its voices to the Left. The new Chamber re-elected on 31 July 1834 Dupin as President of the Chamber with 247 voices against 33 for Jacques Laffitte and 24 for Pierre-Paul Royer-Collard. Furthermore, a large majority (256 against 39) voted an ambiguous address to the king which, although polite, did not abstain from criticizing Louis-Philippe. The latter immediately decided, on 16 August 1834, to put the Parliament in vacation until the end of the year. Theirs and Guizot, who dominated the triumvirate, decided to get rid of Marshal Soult, appreciated by the king for his compliance to his will. Seizing the opportunity of an incident concerning the French possessions in Algeria, they pushed Soult to resign on 18 July 1834. He was replaced by Marshal Gérard, the other ministers remaining in place. Gérard, however, was forced to resign, on 29 October 1834, over the question of an amnesty concerning the 2,000 prisoners detained in April. Louis-Philippe, the Doctrinaires (among whom Guizot and Theirs) and the core of the government opposed it, but the Tiers Parti managed to convince Gérard to pronounce it, underscoring the logistical difficulties in organizing such a large trial before the Chamber of Peers. Gérard's resignation opened up a four month ministerial crisis, until Louis-Philippe finally composed a government entirely issued from the Tiers Parti. However, after André Dupin's refusal to assume its presidency, the king made the mistake of calling, on 10 November 1834, a figure of the First Empire, the duc de Bassano. The latter, crippled with debts, became the object of public hilarity after that his creditors decided to seize his ministerial salary. Frightened, all of the ministers decided to resign, three days later, without even advising Bassano, whose government became known as the "Three Days Minister." On 18 November 1834, Louis-Philippe called Marshal Mortier, duke of Trévise, to the Presidency, and the latter formed exactly the same government as Bassano. This crisis ridiculed the Tiers Parti while the Doctrinaires triumphed. On 1 December 1834, Mortier's government decided to submit a motion of confidence to the Parliament, obtaining a clear majority (184 voices against 117). Despite this, Mortier had to resign two months later, on 20 February 1835, officially for health reasons. The opposition had denounced a government without a leader, accusing Mortier of being Louis-Philippe's puppet. The saying that Theirs had opposed to Charles X, "the king rules but does not govern" (le roi règne mais ne gouverne pas), was addressed this time to the "Citizen King". The polemics which led to Marshal Mortier's resignation, fed by monarchists such as Baron Massias or the Count of Roederer, all turned around the question of the Parliament's prerogatives. On one hand, Louis-Philippe wanted to be able to follow his policy, in particular around "reserved domains" such as military affairs or diplomacy. Head of the state, he also wanted to be able to lead the government, if need by bypassing the President of the Council, the first of all ministers. On the other hand, part of the deputies stated that the ministers needed a leader issued from the parliamentary majority, and thus wanted to continue the evolution towards parliamentarism which had only been sketched with the Charter of 1830. The Charter did not include any mechanism of political responsibility of the ministers towards the Chamber (confidence motion or censorship motion). Furthermore, the function of a President of the Council itself was not registered in the Charter. In this context, the deputies decided to support Victor de Broglie as head of the government, mainly because he was the king's less likely choice, as Louis-Philippe disliked both his anglophilia and his independence. After a three weeks ministerial crisis, during which the "Citizen King" successively called forth the count Molé, André Dupin, Marshal Soult, General Sébastiani and Gérard, he was finally forced to rely on the duc de Broglie and to accept his conditions, which were close to those imposed before by Casimir Perier. As in the first Soult government, the new cabinet rest on the triumvirate Broglie (Foreign affairs) - Guizot (Public instruction) - Theirs (Interior). Broglie's first act was to take a personal revenge on the Chamber by having it ratified (by 289 votes against 137) the 4 July 1831 treaty with the United States, something which the deputies had refused him in 1834. He also obtained a large majority on the debate on the secret funds, which worked as an unofficial motion of confidence (256 voices against 129). Broglie's most important task was the trial of the April insurgees, which began on 5 May 1835 before the Chamber of Peers. The Peers finally inculpated only 164 detainees on the 2,000 prisoners, of which 43 were judged in absentia. Those defendants who were present for their trial multiplied incidents of procedure, and attempted by all means to transform the trial into a tribune for Republicanism. On 12 July 1835, parts of them, among which the main leaders of the Parisian insurrection, escaped from the Prison of Sainte-Pélagie through an underground tunnel. The Court of Peers gave its sentence against the insurgees of Lyon on 13 August 1835, and against the other defendants in December 1835 and January 1836. The sentences were rather mild: a few condamnations to deportation, and lots of short-term prison sentences and some acquittals. Against their hopes, the trial finally turned to the Republicans' disadvantage, by giving them a radical image which reminded the public opinion of the excesses of Jacobinism and frightened the bourgeois. The Fieschi attentat of July 1835, which took place during a review of the National Guard in Paris by Louis-Philippe for the commemorations of the July Revolution, further scared the notables. On the boulevard du Temple , near Place de la République , a machine infernale composed of tens of guns shot on the king. The latter, however, was only lightly injured, while his sons, Ferdinand-Philippe, duc d'Orléans, Louis-Charles d'Orléans, duc de Nemours and François d'Orléans, prince de Joinville, escaped unharmed. However, Marshal Mortier and ten other persons were killed, while tens were injured (among which seven died in the following days). The conspirators, the adventurer Giuseppe Fieschi and two Republicans (Pierre Morey and Théodore Pépin) members of the Society of Human Rights, were arrested in September 1835. Judged before the Court of Peers, they were sentenced to death and guillotined on 19 February 1836. The Fieschi attentat shocked the bourgeois' and most of France, generally more conservative than the people of Paris. The Republicans were discredited in the country, and the opinion ready for energical measures. The first law reinforced the powers of the president of the Cour d'assises and of the public prosecutor against those accused of rebellion, detention of prohibited weapons or insurrectionary attempts. It was adopted on 13 August 1835, by 212 voices against 72. The second law reformed the procedure before the jurys of the Assises. The 4 March 1831 law restricted the declaration of innocence or culpability to the sole juries, excluding the professional magistrates belonging to the Cour d'assises, and requested a 2/3 majority (8 voices against 4) for a culpability sentence. The new law changed that to a simple majority (7 against 5), and was adopted on 20 August 1835 by 224 voices against 149. The third law restricted freedom of press, and provoked passionate debates. It aimed at outlawing discussions concerning the king, the dynasty and constitutional monarchy, accused of having prepared the grounds for the Fieschi attentat. Despite a strong opposition to the draft, the law was voted on 29 August 1830 by 226 voices against 153. These three laws were simultaneously promulgated on 9 September 1835, and marked the definitive success of the policy of Résistance engaged since Casimir Perier against the Republicans. The July Monarchy was thereafter assured of its grounds, discussions concerning its legitimity being outrightly outlawed. The Opposition could now only discuss of the interpretation of the Charter and claim an evolution towards parliamentarism. Demands for the enlargement of the electoral base became more frequent, however, in 1840, leading to the re-appearance of Republican Opposition through the claim to universal suffrage. The Broglie minister, however, finally fell on a question concerning public debt. The Minister of Finances, Georges Humann, announced on 14 January 1836 his intention to proceed to a conversion of the rent in order to lighten the public debt, a very unpopular measures among the supporters of the regime, since the rent was a fundamental component of the bourgeoisie's wealth. Thereby, the Council of Ministers immediately disavowed Humann, while the Duke de Broglie explained to the Chamber that his proposition was not supported by the government. However, his tone was judged insulting by the deputies, and one of them, the banker Alexandre Gouin, immediately deposed a draft law concerning the conversion of the rent. On 5 February 1836, a short majority of deputies (194 against 192) decided to continue the examination of the draft, thus disavowing Broglie's cabinet. The government immediately resigned: for the first time, a cabinet had fallen after having been put in minority before the Chamber of Deputies, a sure victory of parliamentarism. Louis-Philippe thus decided to pretend to play the parliamentary card, with the secret intention of neutralizing it. He took advantage of the ministerial crisis to get rid of the Doctrinaires (Broglie and Guizot), called some Tiers Parti politicians to give an illusion of an opening to the Left, and finally called forth Adolphe Thiers on 22 February 1836, in an attempt to achieve of convincing him to take his distances with the liberal Doctrinaires, and also to burn his legitimity in government until the time came to call forth the Count Molé, whom the king had decided since a long time to make his President of the Council. Louis-Philippe thus separated the center-right from the center-left, strategically attempting to dissolve the Tiers Parti, a dangerous game since this could also lead to the dissolving of the parliamentary majority itself and create endless ministerial crises. Furthermore, as the duc de Broglie himself warned him, when Theirs would eventually be pushed out, he would fatally shift to the Left and transform himself in a particularly dangerous opponent. In the Chamber, the debate on the secret funds, marked by a remarked speech by Guizot and an evasive response by the Justice Minister, Sauzet, was concluded by a favorable vote for the government (251 voices against 99). On the other hand, the draft proposition on the conversion of the rents was easily postponed by the deputies on 22 March 1836, another sign that it had been only a pretext. Theirs' motivations for accepting to be head of government and to take the Ministry of Foreign Affairs were to enable him to negotiate the Duc d'Orléans' wedding with an Austrian archduchess. Since the Fieschi attentat, Ferdinand-Philippe's wedding (he had just reached 25) had become an obsession of the king, and Theirs wanted to be the operator of a spectacular reversion of alliances in Europe, as Choiseul had done before him. But Metternich and the archduchess Sophie of Bavaria, who dominated the court in Vienna, rejected an alliance with the House of Orléans, which they deemed too fragile. Another attentat against Louis-Philippe, by Alibaud on 25 June 1836, justified their fears. These two setbacks upset Theirs. On 29 July 1836, the inauguration of the Arc de Triomphe, supposed to be the scene of a national concord ceremony, during which the July Monarchy would have captured the glory of the Revolution and of the Empire, finally took place in catimini, at seven in the morning and without the king's presence. To re-establish his popularity and in order to take his revenge from Austria, Theirs was considering a military intervention in Spain, requested by the Queen Regent Marie Christine de Bourbon who was confronted to the Carlist rebellion. But Louis-Philippe, advised by Talleyrand and Soult, strongly opposed the intervention, leading to Theirs' resignation. This new event, during which the government had fallen not because of the Parliament but because of a disagreement with the king on foreign policies, demonstrated that the evolution towards parliamentarism was far from being assured. The Count Molé composed a new government on 6 September 1836, including the Doctrinaires Guizot, Tanneguy Duchâtel and Adrien de Gasparin. This new cabinet did not include any personality of the Three Glorious, something the press immediately highlighted. Molé immediately took some humanist measures in order to assure his popularity: generalisation of prison cells to avoid "mutual teaching of crime", suppression of the chain of convicts exposed to the public, royal pardon for 52 political prisoners (Legitimists and Republicans), in particular for Charles X' former ministers. On 25 October 1836, the inauguration of the Obelisk of Luxor (a gift from the vice-king of Egypt, Mehemet Ali) on the Place de la Concorde was the scene of a public ovation for the King. On 30 October 1836, Louis-Napoléon Bonaparte attempted an uprising in Strasbourg, which was quickly countered. The Bonapartist prince and his accomplices were arrested on the same day. The king, wanting to avoid a public trial, and without legal proceedings, ordered that Louis-Napoléon be taken to Lorient where he was put on board the frigate L'Andromède, which sailed for the United States on 21 November. The other conjurees were transferred before the Cour d'assises of Strasbourg, who acquitted them on 18 January 1837. Thereafter, on 24 January 1837, the Minister of War, General Simon Bernard , deposed a draft law - loi de disjonction - aimed at separating, in case of insurrection, civilians, who would be judged by the Cour d'assises, and non-civilians, who would be judged by a war council. The opposition adamantly rejected the project, and surprisingly managed to have the Chamber refuse it, on 7 March 1837, by a very short majority of 211 voices against 209. However, Louis-Philippe decided to go against public expectation, and the logic of parliamentarism, by maintaining the Molé government in place. But the government was deprived of any solid parliamentary majority, and thus paralyzed. During a month and a half, the king tried various ministerial combinations before composing a new government which included Camille de Montalivet, who was close to him, but excluded Guizot, who had more and more troubles working with Molé, confirmed as head of the government. This new government was almost a provocation for the Chamber: not only Molé was maintained, but de Salvandy, who had been in charge of the "loi de disjonction", and Lacave-Laplagne, in charge of a draft concerning the Belgian Queen's dot — both laws having been rejected by the deputies — were also members of the new cabinet. The press spoke of a "Cabinet of the castle" or "Cabinet of lackeys", and all expected it to be short-lived. However, in his first speech, on 18 April 1837, Molé cut short all critics with the announcement of the future wedding of the royal Prince with the Princess Hélène de Mecklembourg-Schwerin. Taken by surprise, the deputies voted the increase of the duc d'Orléans' dowry, which had been previously rejected, as well as the increase of the dowry of the Queen of the Belgians. After this promising beginning, Molé's government managed to obtain in May the Parliament's confidence during the debate on the secret funds, despite Odilon Barrot's attacks (250 voices against 112). An 8 May 1837 ordinance granted general amnesty to all political prisoners, while crucifixes were re-established in the courts, and the Church of Saint-Germain l'Auxerrois , closed since 1831, authorized to renew with cult activities. To demonstrate that public order had been restored, the king passed in review the National Guard on Place de la Concorde. On 30 May 1837, the duc d'Orléans's wedding was celebrated at the château de Fontainebleau . A few days later, on 10 June Louis-Philippe inaugurated the château de Versailles , the restoration of which, begun in 1833, was to establish a Museum of the History of France, dedicated to "all the glories of France". The king had closely followed and personally financed the project entrusted to the architect Pierre-François-Léonard Fontaine. In a symbol of national reconciliation, the military glories of the Revolution and of the Empire, even those of the Restoration, were to sit side by side with those of the Ancien Régime. Molé's government thus seemed stable, helped by the return of economic prosperity. Therefore, the king and Molé decided, against the duc d'Orléans' opinion, that the moment was auspicious for the dissolving of the Chamber, done on 3 October 1837. In order to weigh on the forthcoming elections, Louis-Philippe decided the Constantine expedition in Algeria, a military success of General Valée and the duc de Nemours, second son of Louis-Philippe, who took Constantine on 13 October. However, the 4 November 1837 elections did not respond to Louis-Philippe's hopes. On a total of 459 deputies, only a relative majority of 220 were supporters of the regime. About 20 Legitimists had been elected, and 30 Republicans. The centre-right (Doctrinaires) had approximatively 30 deputies, the centre-left about twice that, and the dynastic opposition (Odilon Barrot) 65. The Tiers parti had only about 15 deputies, and 30 more were undecided. Such a Chamber carried the risk of the formation of a heterogeneous coalition against the government. As early as January 1838, the government was hotly contested, in particular by Charles Gauguier, concerning the deputies who were also civil servants. On 9 January he accused the government of electoral manipulation in order to have loyal civil servants elected. These, who had been 178 in the preceding Chamber, were now 191. Adolphe Thiers and his allies also defied the government, concerning the Spanish affairs. However, with the help of the Doctrinaires, Molé obtained a favorable vote for the address to the king on 13 January 1838, with 216 voices against 116. Molé's cabinet appeared to be taken hostage by the Doctrinaires, at the exact moment when Guizot was taking his distance with the President of the Council. All of Thiers' efforts would be thereafter focused on pushing the Doctrinaires away from the ministerial majority. During the vote on the secret funds, both Guizot, in the Chamber of Deputies, and the duc de Broglie, in the Chamber of Pairs, criticized the cabinet, although accepting to vote favorably. On 10 May 1838, the deputies rejected the governmental plan of railway development, after having adopted, a week earlier, the project on conversion of the rents opposed by Molé. The Peers, however, supported Molé and rejected the latter. On 20 June 1838, Molé succeeded in having the Assembly vote the 1839 budget before the parliamentary vacations. On the opening of the parliamentary session in December 1838, André Dupin was elected by a very short majority (183 voices against 178 for Hippolyte Passy, the center-left candidate and adamant opponent to the "Castle cabinet") as President of the Chamber. A coalition, including Guizot, Thiers, Prosper Duvergier de Hauranne and Hippolyte Passy, had formed itself during summer, but it did not prevent the vote of a favorable address to the King (221 voices for against 208). Confronted to such a slight and incertain majority, Molé presented his resignation to the king on 22 January 1839. Louis-Philippe first attempted to refuse it, and then, approaching Marshal Soult, who was not very convinced, proposed him to take the lead. Soult finally accepted after the funeral of the king's daughter, the duchesse de Wurtemberg, on the conditions of organizing anticipated elections. During the electoral campaign, the left-wing opposition cried out at a constitutional coup, comparing the 1837 and 1839 dissolvings to the consecutive dissolvings of Charles X in 1830. Theirs compared Molé to Polignac, one of Charles X's ministers. The 2 March 1839 elections were a deception for the king, with the loss of two loyal deputies, while the coalition gathered 240 members (against only 199 for the government). Molé presented his resignation to the king on March 8, which Louis-Philippe was forced to accept. After Molé's fall, Louis-Philippe immediately called upon Marshal Soult, who attempted, without success, to form a government including the three leaders of the coalition who had taken down Molé: Guizot, Thiers and Odilon Barrot. Confronted with the Doctrinaires' refusal, he then tried to form a centre-left cabinet, which also stumbled upon Theirs' intransigeancy concerning the Spanish affairs. These successive setbacks forced the king to postpone to 4 April 1839 the opening of the parliamentary session. Thiers also refused to be associated with the duc de Broglie and Guizot. The king then attempted to keep him at bay by offering him an embassy, which provoked the outcries of Thiers' friends. Finally, Louis-Philippe resigned himself to composing, on March 31, 1839, a transitional and neutral government. The parliamentary session opened on 4 April on a quasi-insurrectionary atmosphere, a large mob had gathered around the Palais-Bourbon , seat of the Assembly, singing La Marseillaise and rioting. The left-wing press charged the government of provocations. Thiers supported Odilon Barrot as President of the Chamber, but his attitude during the negotiations for the formation of a new cabinet had disappointed some of his friends. A part of the center-left thus decided to present Hippolyte Passy against Barrot. The latter won with 227 voices against 193, supported by the ministerial deputies and the Doctrinaires. This vote demonstrated that the coalition had imploded, and that a right-wing majority could be formed to oppose any left-wing solution. Despite this, the negotiations for the formation of a new cabinet still were unsuccessful, Thiers making his friends promise to request his authorization before accepting any governmental function. The situation seemed totally blocked, when on 12 May, 1838, the Société des saisons, a secret, Republican society, headed by Martin Bernard, Armand Barbès and Auguste Blanqui, organized an insurrection in the rue Saint-Denis and the rue Saint-Martin in Paris. The League of the Just, founded in 1836, participated in this uprising. However, not only was it a failure, and the conjurees arrested, but this allowed Louis-Philippe to form a new government on the same day, presided over by Marshal Soult who had assured him of his loyal support. Soult's fall contraigned the king to call on the main left-wing figure, Adolphe Thiers. Guizot, one of the only remaining right-wing alternatives, had just been named ambassador to London and left France. Thiers' aim was to establish definitively parliamentarism, with a "king that rules but does not govern", and a cabinet emanating from the parliamentary majority and responsible before it. Henceforth, he obviously went against Louis-Philippe's conception. Thiers formed his government on March 1, 1840. He had first pretended to offer the presidency of the Council to the duc de Broglie, and then Soult, before accepting it and taking in the same time the Foreign Affairs. His cabinet was formed of rather young politicians (47 years-old average), Thiers himself being only 42. Relations with the king were immediately difficult. Louis-Philippe embarrassed Thiers by suggesting him to nominate his friend Horace Sébastiani as Marshal, which would target him to the same criticisms he had previously done against political favoritism and the use of governmental power. Thiers thus decided to postpone Sébastiani's advancement. Thiers obtained an easy majority during the debate on the secret funds in March 1840 (246 voices against 160). Although he was classified as centre-left, Thiers' second government was highly conservative, dedicated to the protection of the interests of the bourgeoisie. Although he had the deputies vote the conversion of the rents, a left-wing proposal, he was sure that it would be rejected by the Peers, which is effectively what happened. On 16 May, 1840, Thiers harshly recused universal suffrage and social reforms after a speech by the Radical François Arago, who had related electoral reform and social reform. Arago was attempting to unite the left-wing by tying together universal suffrage claims and Socialist claims, appeared in the 1840s, concerning the "right of work" (droit au travail). He considered that the electoral reform to establish universal suffrage should precede the social reform, which he considered as an emergency. On 15 June 1838, Thiers obtained the postponement of a proposition made by the conservative deputy of Versailles, Ovide de Rémilly who, seizing himself of an old claim of the Left, aimed at outlawing the nomination of deputies to salaried public offices during their mandate. As Thiers had previously supported this proposition, he was acutely criticized by the Left. Social problems related to the economic crisis started in 1839 provoked since the end of August 1838 strike actions and riots in the textile, clothing and construction sectors. On 7 September 1839, the cabinet-makers of the faubourg Saint-Antoine started to put up barricades. Thiers responded by sending the National Guard and using all the recourses of the laws prohibiting public meetings. Thiers also renewed the Banque de France 's privilege until 1867 at so advantageous conditions that the Bank had a commemorative gold medal wedged. Several laws also established steam ocean liners, their exploitation being conceded to companies subsided by the state. Other laws granted credits or guarantees to railway companies in difficulty. At the same time that Thiers favored the conservative bourgeoisie, he also made sure to satisfy the Left's want of glory. On 12 May 1840, the Minister of the Interior, Charles de Rémusat, announced to the deputies that the king had decided that the remains of Napoléon would be transferred to the Invalides . With the British government's agreement, the prince de Joinville sailed to Saint Helena on the frigate La Belle Poule to retrieve them. This announcement immediately struck the public opinion, which enflammed itself with patriotic fervor. Thiers saw in this act the achievement of the rehabilitation of the Revolution and of the Empire, which he had attempted in his Histoire de la Révolution française and his Histoire du Consulat et de l'Empire, while Louis-Philippe, who was reluctant, aimed at capturing for himself, a touch of the imperial glory, just as he had appropriated the legitimist monarchy's glory in the Château de Versailles. The prince Louis-Napoléon decided to seize the opportunity to land in Boulogne-sur-Mer on 6 August 1840, with the aim of rallying the 42nd infantry regiment (42e régiment de ligne) along with some accomplices among whom one of Napoléon's comrades in Saint Helena, the General de Montholon. Although Montholon was in reality a double agent used by the French government to spy, in London, on Louis-Napoléon, Montholon deceived Thiers by letting him think that the operation would take place in Metz. However, Bonaparte's operation was a complete failure, and he was detained with his men in the Fort of Ham (Picardie ). Their trial took place before the Chamber of Peers from 28 September 1840 to 6 October 1840, in a general indifference. The public's attention was concentrated on the trial of Marie Lafarge, before the Cour d'assises of Tulle, the defendant being accused of having poisoned her husband. Defended by the famous Legitimist lawyer Pierre-Antoine Berryer, Bonaparte was sentenced to life detention, by 152 votes (against 160 abstentions, on a total of 312 Peers). "We do not kill insane people, all right! but we do confine them, declared the Journal des débats, in this period of intense discussions concerning parricides, mental disease and reform of the penal code. The conquest of Algeria, initiated in the last days of the Bourbon Restoration, was now confronted to Abd-el-Kader's raids, punishing Marshal Valée and the duc d'Orléans's expedition to the Portes de Fer in autumn 1839, which had gone against the clauses of the 1837 Treaty of Tafna between General Bugeaud and Abd-el-Kader. Thiers pushed in favor of a colonisation of the interior of the country, until the limits of the desert. He convinced the king, who saw in Algeria an ideal theater for his son to cover the House of Orléans of glory, and persuaded him to send General Bugeaud as first governor general of Algeria. Bugeaud, who would lead a harsh repression against the natives, would be officially nominated on 29 December 1840, a few days after Thiers' fall. Thiers supported Mehemet Ali, the pasha of Egypt, in his ambition to constitute a vast Arabian Empire from Egypt to Syria. He tried to intercede in order to have him sign an agreement with the Ottoman Empire, unbeknownst to the four other European powers (England, Austria, Prussia and Russia). However, informed of these negotiations, the British Minister of Foreign Affairs, Lord Palmerston, quickly negotiated a treaty between the four powers to sort out the "Eastern Question". When revealed, the London Convention of 15 July 1840 provoked in France an explosion of patriotic fury: France had been ousted from a zone where it traditionally exercised its influence, while Prussia, which had no interest in it, was associated to the treaty. Although Louis-Philippe pretended to join the general protestations, he knew that he could take advantage of the situation to get rid of Thiers. The latter flattered patriotic feelings by decreeing, on 29 July 1840, a partial mobilization, and by starting, on September 13, 1840, the works on the fortifications of Paris. But France remained passive when, on 2 October 1840, the British navy shelled Beirut . Mehemet Ali was then immediately destituted by the Sultan. Following long negotiations between the king and Thiers, a compromise was found on 7 October 1840: France would renounce in supporting Mehemet Ali's pretensions on Syria but would declare to the European powers that Egypt should remain at all costs independent. England thereafter recognized Mehmet Ali's hereditary rule on Egypt: France had obtained a return to the situation of 1832. Despite this, the rupture between Thiers and Louis-Philippe was now definitive. On 29 October 1840, when Charles de Rémusat presented to the Council of Ministers the draft of the speech of the throne, prepared by Hippolyte Passy, Louis-Philippe found it too aggressive. After a short discussion, Thiers and his associates collectively presented their resignation to the king, who accepted them. On the following day, Louis-Philippe ordered to fetch Marshal Soult and Guizot so they could rejoin Paris as soon as possible. When Louis-Philippe called to power Guizot and the Doctrinaires, representants of the center-right after the center-left Thiers, he surely imagined that this would be only temporary, and that he would soon be able to call back Molé. But the new cabinet formed by Guizot would remain closely knit, and finally win the king's trust, with Guizot becoming his favorite president of the Council. On 26 October 1840, Guizot arrived to Paris from London. He took for himself the Ministry of Foreign Affairs and let Soult assume the nominal presidency. This satisfied the king and the royal family, while Guizot himself was sure of his ability to manipulate the old Marshal Soult as h wished. As the center-left had refused to remain in the government, Guizot's cabinet included only conservatives, ranging from the ministerial center to the center-right Doctrinaires. The July Column was erected in honor of the Three Glorious Days. The Orient Question was settled by the London Straits Convention of 1841, which permitted the first reconciliation between France and England. This in turn increased public favor towards the colonization of Algeria. Both the government and the Chamber were Orleanists. Those were divided into Odilon Barrot's Dynastic Left (Gauche dynastique), which requested the enlargement of electoral cens to the petty bourgeoisie and had as mouthpiece Le Siècle; the center-left, headed by Adolphe Thiers, which aimed at restricting the royal prerogatives and influence, and which had as mouthpiece Le Constitutionnel; the conservatives, headed by Guizot and Count Molé, who wanted to preserve the regime and defended their ideas in Le Journal des débats and La Presse. Guizot refused any reforms, rejecting a decrease of the electoral cens. According to him, the monarchy should favor the "middle classes", gathered by land ownership, a "moral" tied to money, work and savings. "Enrichissez-vous par le travail et par l'épargne et ainsi vous serez électeur !" (Get rich through work and savings and then you will be electors!) was his famous statement. Guizot was helped in his aims by a comfortable rate of economic growth, averaging about 3,5% a year from 1840 to 1846. The transport network was quickly enlarged. An 1842 law organized the national railway network, which passed from 600 to 1,850 km, a sure sign that the Industrial Revolution had fully reached France. This period of Industrial Revolution was characterized by the appearance of a new social phenomena, baptized pauperism. Related to industrialization and the rural exodus, working poors were common. Furthermore, the former congregations of the Ancien Régime had disappeared. Workers had 14 hours work, daily wages of 0,20 Francs, and no possibility of organizing themselves in trade unions. 250,000 beggars were registered, and 3 million citizens registered in the charity offices. State assistance was nonexistent. The only social law of the July Monarchy was to outlaw, in 1841, labor of children under 8 years old, and night labor for those of less than 13 years. The law, however, was almost never implemented. Christians imagined a "charitable economy", while the ideas of Socialism, in particular Utopian Socialism (Saint-Simon, Charles Fourier, etc.) diffused themselves. Blanqui theorized Socialist coups d'état, the socialist and anarchist thinker Proudhon theorized mutualism. On the other hand, Liberals, inspired by Adam Smith, imagined a solution in laissez-faire and the end of tariffs, which Great Britain, the dominant European power, had started in 1846 with the repeal of the Corn Laws. In 1843, Karl Marx arrived in Paris and met there Friedrich Engels. Paris at this time was the home and headquarters to German, British, Polish, and Italian revolutionaries. Marx had come to Paris to work with Arnold Ruge, another revolutionary from Germany, on the Deutsch-Französische Jahrbücher, while Engels had come especially to meet Marx. There, he showed him his work, The Condition of the Working Class in England in 1844. Marx wrote for the Vorwärts revolutionary newspaper, established and run by the secret society called League of the Just, and studied Proudhon, whom he criticized in The Poverty of Philosophy (1847). He developed his theory of alienation in the Economic and Philosophical Manuscripts of 1844, published posthumously, as well as his theory of ideology in The German Ideology (1845), in which he criticized the Young Hegelians: "It has not occurred to any one of these philosophers to inquire into the connection of German philosophy with German reality, the relation of their criticism to their own material surroundings.". For the first time, Marx related history of ideas with economic history, linking the "ideological superstructure" with the "economical infrastructure", and thus tying together philosophy and economics. Inspired both by Friedrich Hegel and Adam Smith, he imagined an original theory based on the key, Marxist notion, of class struggle, which appeared to him self-evident in the Parisian context of insurrection and permanent turmoil. "The dominant ideology is the ideology of the dominant class," did he conclude in his essay, setting up the program for the years to come, a program which would be further explicited in The Communist Manifesto, published on 21 February 1848, as the manifesto of the Communist League, three days before the proclamation of the Second Republic. Arrested and expelled to Belgium, Marx was then invited by the new regime back to Paris, where he was able to witness the June Days Uprising first hand. The 1846 harvest was poor, in France as elsewhere (especially Ireland, but also Galicia and Bohemia). A rise in the price of wheat, the dietary staple of the common people, provoked a food shortage, while purchasing power decreased. The resulting fall in domestic consumption led to a crisis of industrial overproduction. This in turn immediately led to massive lay-offs, and thus to a large withdrawal of savings, leading to a banking crisis. Bankruptcies multiplied, and stock prices on the stock exchanges collapsed. The government reacted by importing Russian wheat, which created a negative balance of trade. The program of public works therefore stopped, including attempts to improve France's coastal defences. Robert Peel's government in England collapsed in 1846 in disputes over the Corn Laws, bringing the Liberals back into government led by Lord Russell and Lord Palmerston. The appointment of Lord Palmerston was regarded as a threat to France. Guizot's efforts to bring about rapprochement with Britain in the early 1840s was virtually undone by the Affair of the Spanish Marriages, which broke out that year after Palmerston attempted to wed the Spanish queen to a member of the House of Saxe-Coburg and Gotha rather than to a member of the House of Bourbon, as Guizot and his British counterparts had agreed to earlier in the 1840s. Henceforth, there was an increase in workers' demonstrations, with riots in the Buzançais in 1847. In Roubaix , a city in the industrial north, 60% of the workers were unemployed. At the same time, the regime was marred by several political scandals (Teste-Cubières corruption scandal, revealed in May 1847, or Charles de Choiseul-Praslin's suicide after having murdered his wife, daughter of Horace Sébastiani). Since the right of association was strictly restricted, and public meetings prohibited after 1835, the Opposition was paralyzed. In order to sidestep this law, political dissidents used civil funerals of their comrades as occasions of public demonstrations. Family celebrations and banquets also served as pretexts for gatherings. At the end of the regime, the campagne des banquets took place in all of the big cities of France. Louis-Philippe firmly reacted to this threat, and prohibited the final banquet, which was to be held on 14 January 1848. Postponed to 22 February, this banquet would provoke the February 1848 Revolution. After some unrest, the king replaced Guizot by Theirs who advocated repression. Greeted with hostility by the troops in the Carrousel, in front of the Palace of the Tuileries, the king finally decided to abdicate in favor of his grandson, Philippe d'Orléans, entrusting the regency to his daughter-in-law, Hélène de Mecklembourg-Schwerin. It was in vain as the Second Republic was proclaimed on 26 February 1848, on the Place de la Bastille , before the July Column . Louis-Philippe, who claimed to be the "Citizen King" linked to the country by a popular sovereignty contract in which he found his legitimity, did not see that the French people were advocating an enlargement of the electoral body, for some by a decrease of the electoral tax, and for others by the establishment of universal suffrage. Although the end of the July Monarchy was close to being a civil war, the period was also characterized by an effervescence of artistic and intellectual creation. French: "coalition de tous les talents"
Karl Marx, The German Ideology, 1845 (Part I, " Ideology in General, German Ideology in Particular"
Pinkney, David H. “Laissez-Fair or Intervention? Labor Policy in the First Months of the July Monarchy.” in French Historical Studies, Vol. 3. No. 1. (Spring, 1963), pp. 123–128.